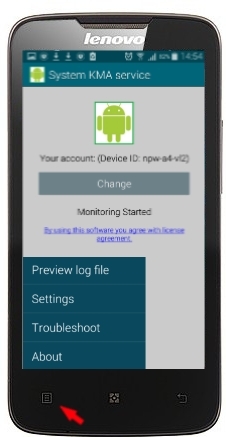 StaffCounter PRO for Android – a hidden monitoring appication. It is easy to download and install. For Android 4.1 and newer. Writes all activity to a log file and sends it to the data.staffcounter.net server. Invisible. StaffCounter Pro is not visible in the main Application list by default. Tracks the user’s web use, namely the addresses and the amount of time he/she spends on sites. Records incoming and outgoing messages of 11 Messengers: IMO, Skype, Facebook, Line, Viber, Whatsapp, Kik, Hike, BBM, Tango and KakaoTalk. How to prepare a phone for StaffCounter PRO installation. Disable anti-virus protection for a while, because any monitoring program can be detected as a spyware. You need to other monitoring applications, including free version of StaffCounter monitoring agent, because it is incompatible with StaffCounter PRO. Uninstall Helper Service, if it was installed before. Open installed application. Here you need to click all these buttons from top to botton to configure and connect the application to your account. Go back and click Connect to Server. Click on Your account. Write your e-mail address, user for the registration on staffcounter.net. Delete the packages if you don’t need them anymore. How to prevent StaffCounter PRO from being stopped by built-in power-saving programs. To change the settings, click hardware menu button or use menu of StaffCounter PRO applcaiton. Click Settings. Configure all features you need. Note, that some menus have sub-menu. 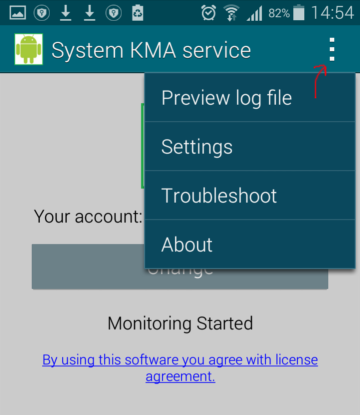 Find Support Android and uninstall it.